More from Transport for London's road modernisation plan, this time at Stockwell with a major focus on cyclists. 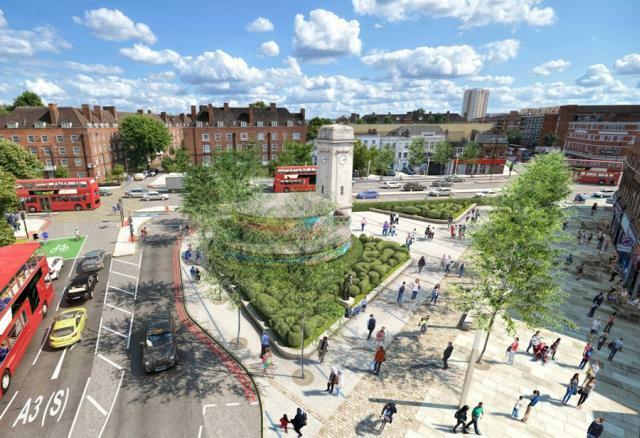 TfL proposes to change Stockwell Cross gyratory into a crossroads by closing the southern part of South Lambeth Road, which would make Stockwell Memorial Garden a more easily accessible public space, and add more trees and seating. When it comes to cyclists, TfL acknowledges that the numbers using the junction — which is on Cycle Superhighway 7 — have doubled since 2001, and expects further rises. Measures planned include separating cyclists from traffic on Clapham Road between Stockwell Road and Stockwell Terrace, new cycle lane sections on Stockwell Road and South Lambeth Road, a new green signal just for cyclists, better ASLs and widening bus lanes south of the tube station (this would be done by reducing the pavements, but you'll still have 6m of space outside the station). There's a map available (PDF) with details of all changes. Lambeth Cyclists says it "welcome[s] these proposals as a step towards making Lambeth and London more cycle-friendly"; if you want to have your own say, TfL's consultation is open until 18 January. If everything gets the go-ahead, work will start around May 2015. See also: changes planned for Old Street and Vauxhall Cross.